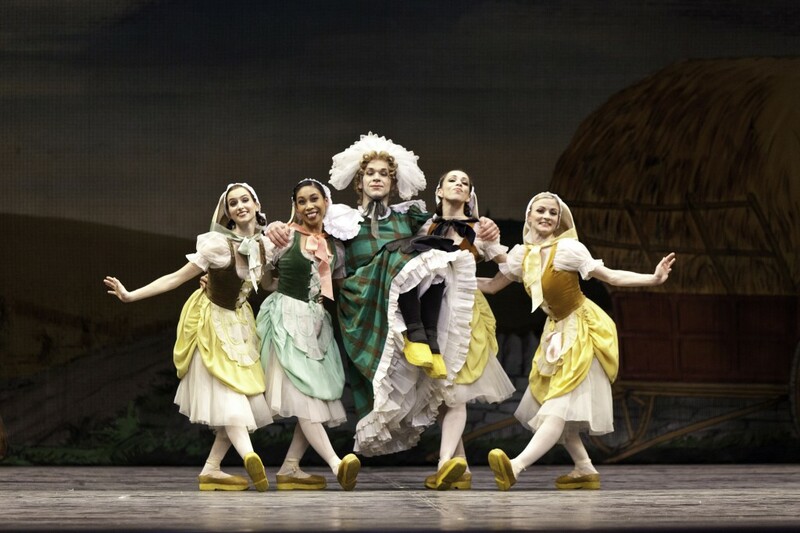 La Fille Mal Gardee is a very old ballet, dating back to 1789. It’s an old-fashioned story featuring old-fashioned caricatures that walk the line of being offensive in today’s PC world. But it’s charming and it’s funny (really funny, actually) and there’s no point in throwing out Beethoven just because Bernstein came along. I love narrative ballet but I have very little patience for the mime-then-dance structure they often lean on. Sir Frederick Ashton’s choreography, especially in act one, does a wonderful job of forwarding both story and character through movement. Said story, of the love-struck daughter of an overly strict and disapproving mother, isn’t quite big enough for a full length piece, so the already economically timed ballet has plenty of filler (and an odd amount of in-story performance), but when the story is actually being told, it’s being told very well. From the start of Ferdinand Herold’s beautiful overture, courtesy of the ballet’s top-notch and far-too-often-overlooked orchestra, the music is dream-like in its prettiness, and Ashton’s choreography is beautiful, clevery funny, and well-executed across the board. One of my favourite principal dancers, Jillian Vanstone makes for a sweetly optimistic Lise (the titular fille who would rather run off with her farmboy lover Colas than marry the man her mother has chosen). Vanstone’s star-calibre pointe work is less interesting than her joyful wit and wonderful sense of timing as she joins Naoya Ebe’s impressively danced Colas in a love affair that’s as charming as it is forbidden. Ebe, though stunning in his execution of Ashton’s more challenging sequences, gets outshone by Christopher Stalzer, the corps de ballet member who’s been cast above his rank to steal the show as Lise’s suitor Alain. Stalzer is deliciously dopey but inescapably bighearted as the intellectually challenged Colas alternative, a true example of how dance can be used to convey specific character and deep emotion even more than just great beauty. The ballet shows its age when the well-meaning underdog gets nothing in the end aside from mocked (this post-modern age would never produce a piece of the like) but, ever-easily pleased, Alain finds great happiness in the retrieval of his beloved red umbrella, so all is right in the world. Another mark of La Fille‘s age is the dangerously pantomime-y cross-casting of Widow Simone, Lise’s outrageously controlling mother. Such silliness is often irredeemably hammy, but the cross-casting (danced with wonderful showmanship by Matjash Mrozewski) allows for some hilarious partnering work from the mother-daughter duo, a tribute to Ashton’s great creativity. The chorus is large and energetic, though their parts are mostly the aforementioned filler I’m not so fond of. There’s a ton of ribbon work in the piece, including a complicatedly winding maypole dance, an over-done act two showpiece from the female chorus and a truly lovely pas de deux between Lise and Colas where the ribbon becomes a storytelling device and comical prop more than a showy hindrance. The best ensemble work comes from the utter delight of seeing a foursome of chickens dance ballet. Led by Skyler Campbell’s fabulously cocky cockerel, the chorus of hens made me laugh out loud with their oddly on-point dance imitation of fowl behaviour. The more serious action of the second act doesn’t resonate quite as well as the lighthearted sweetness of the first, though the overall effect remains delightful in its comic simplicity. Sir Osbert Lancaster’s design resembles a painting, giving the overall effect that what you’re watching is a beautiful, if two-dimensional, pastoral landscape; add some hearty laughs and a couple moments of emotional poignance (mostly thanks to that beautiful act one pas de deux and Alain’s quiet heartbreak) and that’s essentially what La Fille Mal Gardee is. Drag Race S10 Ep9: Cute for You, but What About Us? Guys, Are You Watching Riverdale? !